Founded in 1999 by longtime friends Thierry Bellisha and Haimy Mann, CrownRing masterfully designs matrimonial jewelry fit for royalty. 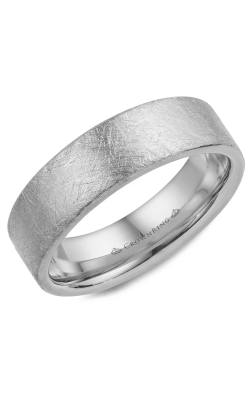 To commemorate the special union between a couple and the ever-lasting love thereafter, CrownRing designs architecturally stunning wedding bands for both men and women. Available in white, yellow, and rose golds, CrownRing wedding bands feature both traditionally clean and sleek designs and contemporary trendsetting styles sure to please all taste preferences. With a multitude of design styles available, CrownRing's aesthetic is one of elegant flair matched by high-levels of wearer comfort. Excited to meet the demands for quality wedding bands in the Michigan area, Medawar Jewelers is honored to supply an extensive collection of CrownRing wedding bands. As authorized retailers of the designer name CrownRing, Medawar Jewelers proudly presents five of CrownRing's most popular collections out today. Their experienced and friendly staff is always prepared to introduce guests to the distinguished line of available CrownRing wedding bands. Among the many beautiful collections, browse through the Classic line of wedding bands featuring textured, matte, and polish combination bands and their Traditional bands with well-polished bands available in golds from 3mm-8mm. For the bold, Medawar Jewelers supplies the intricate designs of the Rope line. Last, Medawar Jewelers offers the excellent quality craftsmanship in CrownRing's Diamond collections. The Diamond collection's unique usage of stones make for exemplary fashion-forward wedding bands fit for nobility. Why Buy from Medawar Jewelers? Committed to serving their loyal customers in the West Lansing, Okemos, Jackson, Portage, and Brighton areas of Michigan, Medawar Jewelers offers premium quality engagement rings, wedding bands, and fashion jewelry from such sought-after names as A. Jaffe, Benchmark, Parade, Pandora, Verragio, and Tacori among many others. Additionally, family owned Medawar Jewelers also offers luxurious timepieces from Seiko and an extensive assortment of top-quality loose diamonds. For over 35 years, Medawar Jewelers has been earning the loyalty of their Michigan customers with full-service options including comprehensive jewelry repair, risk-free shopping, and easy financing.